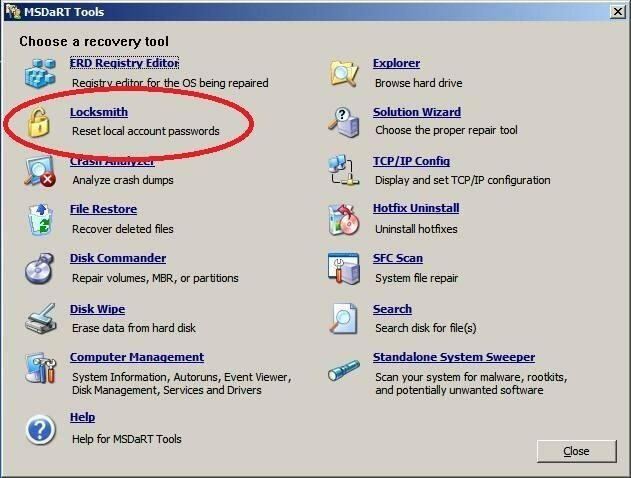 There are many ways to reset or change a lost Administrator or Windows Account passwords in Windows XP, Windows Vista or Windows 7. 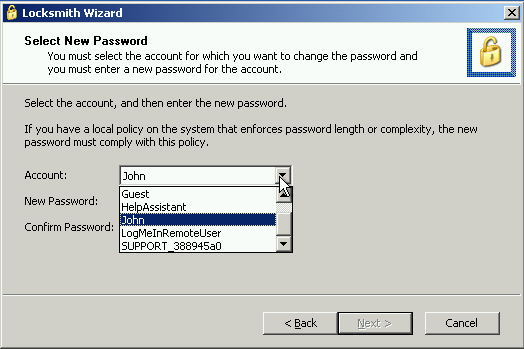 If you are unable to log on to a system because you have lost the local administrator password or because the administrator password has been locked out, you can use the Locksmith Wizard in ERD Commander / MS DaRT to reset the account password. It’s usually easier to change or reset the Administrator password than it is to recover an existing password. Locksmith – part of ERD Commander / MS DaRT is an excellent and simple tool that is run from an ERD Commander MS DaRT live CD, which can be used to reset the Administrator password. 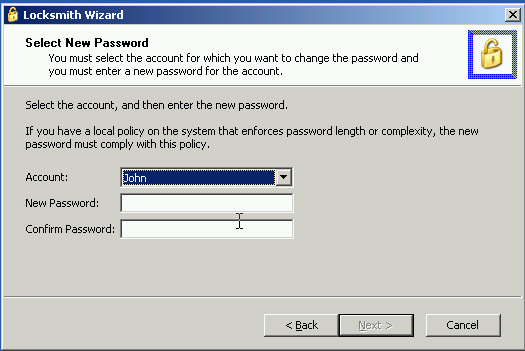 Once the main Administrator password has been reset and is known, other account passwords can be changed by starting the computer with the Administrator account. You will lose a previous change if you rerun the Locksmith Wizard to change another password before you restart the system. The Locksmith Wizard requires the System Registry hive to be intact. If you have a local policy on the system that enforces password length or complexity, the new password must comply with this policy. Boot your computer with ERD Commander / MS Dart Boot CD – See: Using ERD Commander for Windows XP. You may have to set the boot order in the BIOS first. In the Account list select the account that you want to modify. In the New Password box, enter the new password. In the Confirm Password box, enter the new password again. The password that you enter in the Locksmith Wizard is temporary. It enables the account if it was previously disabled. 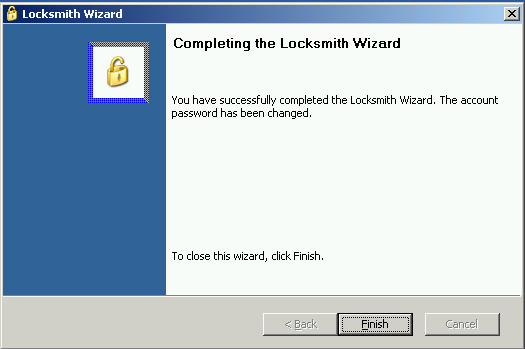 The Locksmith Wizard clears the Password never expires property for the account, which forces you to change the temporary password when you log on to the system. The Locksmith Wizard does not work on domain controllers. You can perform some tasks using ERD Commander 5.0 (for XP) on 32bit Vista and Windows 7 systems. With 32Bit systems you should be able to attach to the installation, and use Locksmith to reset Windows passwords and use Windows Explorer to move files onto a USB memory key or external hard drive (see here). However attaching to Vista or Windows 7 installations wipes out any System Restore points, so this should be done with caution. 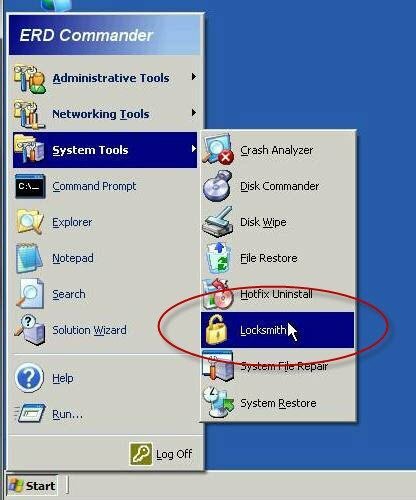 With 64bit Windows 7 and Vista systems it will not be possible to attach to the installation and use Locksmith to reset passwords. How about doing this on Windows 8.0 or 8.1, where the boot procedure is restricted only to Windows own Bootable CD? Tried to boot with AVG Antivirus Rescue Bootable CD and with Linux Bootable CD, booth ended up unsuccessfully due to some restriction in the system. Do anyone have any good solution for this? A poor utility compared to Passcape’s solution, for example. I had troubles resetting my Live ID password while the passcape tool worked flawlessly.